It’s a Barty party in Miami. 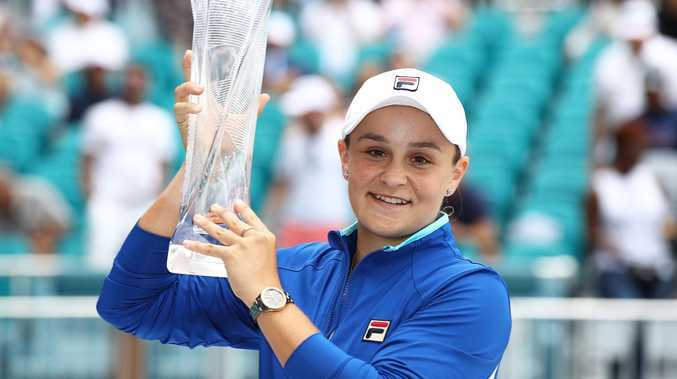 Aussie Ash Barty has won the biggest singles title of her career, defeating Karolina Pliskova 7-6 (7-1) 6-3 to claim the trophy at the Miami Open. The victory has thrust the 22-year-old into the top 10, making her the first Australian to occupy those ranks since Sam Stosur in 2013. She also made history by becoming the first player from Down Under to win the Miami Open. Barty blasted a career-high 15 aces to win the final, adding a fourth WTA singles crown to her resume after victories at the 2017 Malaysian Open and last year at Nottingham and Zhuhai, China. Barty, who took home a $US1.3 million top prize, lost her only prior WTA final this year in January in Sydney to Czech Petra Kvitova in a third-set tiebreak. Seventh-ranked Pliskova, who ousted Barty in the fourth round of last year's US Open, failed to claim her 13th career title and second of the year after a win in Brisbane in January. "It was important for me to try and continue to make it physical," Barty said. "I knew I had to have my running shoes on to try and make as many balls as possible. "You don't get these opportunities every single day so it was important for me to continue to try and do the right things and enjoy the moment as well." The Queenslander pointed to Wimbledon last year - where she was knocked out of the singles draw in the third round - as a turning point in her career and she's travelled on an upward trajectory since then. "It's been a phenomenal two weeks," Barty said. "A bit of a turning point was Wimbledon last year. We've been able to roll with it and we've played some really good tennis since then." Barty overcame Stosur in the second round then dismissed Kvitova in the quarter-finals en route to the last weekend of the Miami tournament and was clinical as she surged to her straight sets win in the decider. The Australian No. 1 was 3-1 down against 27-year-old Pliskova but responded with excellent shot-making to force a tiebreak and outclass the Czech world No. 7 by winning six straight points for the first set. Pliskova, who was also competing in her first Miami final and whose semi-final win over Simona Halep finished after 1am local time due to rain delays, fought off four break points before submitting on a fifth as Barty built a 3-1 second set advantage. From there, the fatigued Czech put up little resistance with Barty firing down 15 aces during the match to secure the biggest title of her career in one hour and 40 minutes, pumping her fists when Pliskova sent a forehand long on match point.